Robert Kinoshita will be speaking at the Hollywood Heritage Museum in Hollywood, California on Wednesday at 7:30 pm. 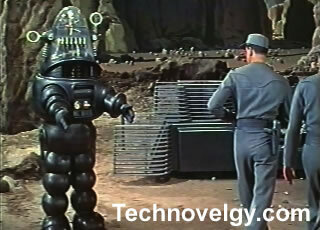 He designed the original robots for Forbidden Planet (Robby the Robot) and Lost in Space (Robot B9). Although these creations may look dated next to the computer graphic creations of recent years, I can tell you they looked cool back then. And there were a lot of kids who wore aluminum robot suits for Halloween, too. Thanks to Robots.net for the heads-up.